Kevin Patton: I don’t think it works very well to tell our students to be ethical, we have to show them what ethical looks like. Audio: Welcome to The A&P Professor, a few minutes to keeping human anatomy and physiology with host, Kevin Patton. Kevin Patton: In this episode we’re going to see if a new micro=organ has been discovered in the human body. I’ll mention the Succeed in A&P podcast and we’re going to resume our conversation about modeling academic integrity and a bunch of other stuff. Kevin Patton: A couple of weeks ago I ran across a headline that stated, “Researchers Discover New Micro-Organ in Human Immune System” and you know me, I’m always attracted to headlines that claim that there’s a new organ in the human body. Cause well you know sometimes there is. What really intrigued me about this one is they didn’t really call is an organ, they called a micro-organ and I don’t even know what that is so I had to read the article. I’m glad I did because I was referring to a piece that came out on August 22nd in Nature Communications and it’s entitled Memory B-cells are Reactivated in Subcapsular Proliferative Foci of Lymph Nodes. Kevin Patton: Basically what it described was some experiments in which they demonstrated that memory B-cells that are produced during and after an infection in an area get trapped in the nearby lymph nodes, which is not surprising and they hang out there, which is also not surprising. But they form a focus, a location that is distinct from the germinal center of the lymph node, it’s distinct both functionally and structurally from the germinal center. These folks decided to call it a subcapsular proliferative focus or plural would be foci or foci. It’s subcapsular because it’s just inside the capsule, just deep to the capsule which forms the wall of the lymph node and it’s proliferative because it’s made up of memory B-cells which we know when triggered will proliferate and form groups of more memory B-cells and some plasma cells which are going to be actively producing anti-bodies against the antigen that triggered the formation of those memory B-cells to being with. Kevin Patton: It’s called a focus because it’s a location, right? These SPF’s which is a lot easier to say subcapsular proliferative foci or foci and so the SPF’s that’s what new. The authors, I couldn’t find anywhere in there where they called it a micro-organ, maybe I just missed it. But the point is, is that we’ve never really seen it before, never really noticed it before and it’s really interesting that when these memory B-cells, they hang out there, which makes sense they’d hang out in the lymph node but at a particular location just inside the capsule where they are most likely to encounter the antigen that they’re programmed for. Encounter again if there’s a new episode of encountering the antigen that they’re programmed for. It would be right there in the outer area, not deep in the germinal center. So it makes sense that it would be there, right? Kevin Patton: It also makes sure that it’s a good place for the macrophages which are acting as antigen presenting cells that they would be able to get to those memory B-cells very easily and not only are the memory B-cells hanging out there but there are a bunch of helper T-cells and presumably other cells that are going to be involved in this whole process of getting those memory B-cells activated and proliferating and producing the plasma cells which are going to be producing the anti-bodies and all of this together means that that process of this secondary response to the antigen, the original antigen is going to be that much more efficient. Now we’re seeing how it gets to be so efficient and the authors of this communication proposed that knowing about this may help us do vaccines better. Because isn’t that what vaccines are doing is giving us that original antigen exposure and getting those memory B-cells in place. Now we know where there place is, at least one of the places is that they’re going to be ready at a moment’s notice to mount that very strong and very rapid secondary response which is the whole point of doing a vaccine. Right? Some interesting things in the immune system these days. Kevin Patton: I don’t know if you’ve ever heard of Nuzzel but it’s an interesting service, it’s only been out there for a couple of years in which it gathers the most popular headlines from among the people that you’re connected with on social media. So I signed up for that as the AP Professor which you probably already know has a Twitter presence, Facebook presence and Instagram presence, a Tumbler presence, a oh I don’t know, the list goes on. What Nuzzel does is it scans all of those and looks for the things that are being shared the most by the people in my social network, or in the social network of the A&P Professor. What is does is it gathers it together and it allows me to curate from among those headlines, things that I think will be of interest to other A&P Professors. I put it together in this Nuzzel newsletter which you can subscribe to for free and you would go to Nuzzel, that’s n-u-z-z-e-l.com/theAPProfessor and just sign right up. Put your email in and everyday, Monday through Friday, you’ll get a list of two or three or four or five or 10 headlines that I think you might be interested in. Kevin Patton: You can just scan through them and see if there’s anything that interests you and you can click on any one of them and go to the original article that headline is associated with. That would be an easy way to keep up with things. So try my Nuzzel newsletter, the link is in the show notes and at the episode page at theAPProfessor.org. Kevin Patton: Well I had a really nice surprise this morning when I was flipping though my podcasts and I saw that there was a new episode of the podcast, Succeed in A&P which I mentioned on this show before. It is put out by my friend Jim Connely over at McGraw Hill Higher Education and I noticed that this one was an interview with Krista Rompolski whose name you probably recognize because I’ve mentioned her before on this podcast. You may recall the syllabus episode when we talked about her first day power point and we talked about some of the things that she does on the same day that she hands out the syllabus. Anyway, so I’m listening to this thinking well this is going to be an especially good episode because I like Jim and I like Krista and they both have interesting things to say and this one disappoint me. But the pleasant surprise came in when they mentioned this podcast, the A&P Professor. So I really appreciate the shout out and so I want to shout to them again and something that Jim mentioned in his show was something that he and I had talked about when we were at the HAPS conference together. Kevin Patton: That is that we’re going to do an exchange where I go on his show and offer an interview and he’s going to come on my show for an interview. So that’s something to look forward to. But in the meantime look in the show notes, in the episode page for this episode and there will be a link to Succeed in A&P or you can just search for it in iTunes or wherever you get your podcast and you can listen to it there. Kevin Patton: You remember Greg Crowther, right? He’s the guy who composed and sang the song, A Physiologist’s Blessing that I played in the last episode. That was a lot of fun, wasn’t it? Well Greg called in because he has something to say about that other topic that came up in the previous episode on academic integrity. Here’s what he had to say. Greg Crowther: The legal issue about whether you’re legally allowed to do that, I kind of put in a separate category. I think as you said, in your show, the copyright law is complicated and I’m less concerned about figuring out technically whether we are in violation of all the nuances of copyright law but I think at a bare minimum we need to do what we ask our students to do which is to say, “This is my original work,” or, if it’s not my original work, this is where I got it from. Kevin Patton: I agree with Greg 100%, I think that setting aside the legal issues will allows us to focus on the issues on professional integrity and best practice. I agree that the best practice for professional integrity in an educational setting is for us professors to model this idea of citing other people’s work. A lot of us, probably all of us, if we’re using power point in our presentations, we are using images from the textbook that we’re using and our publisher provides us those images for that purpose. We also, most if not all of us bring in additional images because well a textbook, no textbook, no matter how big it is can fit all of the images that we’d like to use in teaching and learning. Of course we all have our own way of telling the story and so that’s probably going to require different images than are in the textbook or at least additional images than those that are found in the textbook. Kevin Patton: When we do so, do we just throw them in there or do we cite them? Do we either tell the students where they’re from or do we cite them in the slide itself and show that this is from Grey’s Anatomy. This is from wherever, whatever source it comes from, where did it come from. By doing that citation on a regular basis, by showing the students that we are scrupulous about citing everything that is not coming in from our own work, that is not generated by we ourselves, then we are practicing what we are preaching to them when they do their assignments whatever those assignments are. Term papers, maybe they’re turning in presentations, power points, maybe they’re doing a case study project that they cite where they’re getting their information. Where they’re getting the images or diagrams that they’re using. 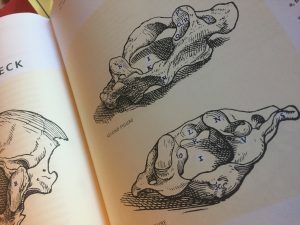 Kevin Patton: I may have mentioned in previous episodes that I teach in a graduate program for people who either are teaching anatomy and physiology or are preparing to do that. It’s a Master of Science in Human Anatomy and Physiology Instruction, HAPI. HAPI for short. So we have a HAPI graduate program and I’ll get into more detail about that program in a future episode. But all of us in that program we have our students producing some teaching materials as they study the human anatomy and physiology that they need to take into the classroom. When they do a power point or term paper or whatever, a test bank, if they are using an image or something created outside of what they’re doing, they have to cite it. They have to put in there what the source is. As a matter of fact, we ask them to put in the source even when they’re taking something out of the text book they’re using for the course. We have them cite in there which textbook it’s from. One of the reason we do that is because of this best practice thing that Greg is talking about. Kevin Patton: But another reason we do that is just for our own purposes as instructors, that’s a good habit to get into. Because all of you do this right? Where you’ll put together a presentation and then a year, two year, five years or in my case 25 years later, well now 25 years ago I don’t think I was using power point, we were using overhead acetate transparencies on an overhead projector. But my point is, is that I need to know, well first of all, I’m going to mix and match those, I’m going to go back to my old presentation, I’m doing that all the time. Where I pull out a few slides here and start over again. Or I pull out a few slides here and put them into a different presentation. Like I might be to a later chapter and I think, oh yeah we need to review what signal transduction is and we first introduced that when I was talking about the plasma membrane, way back at the beginning of A & P one and now here we are in the endocrine system or here we are in the nervous system or here we are in some other system and I need to talk about signal transduction, I’m going to go back and pull those slides and add them in here. Kevin Patton: If we didn’t cite on every slide where those images came from, we might not know where their origin was. Then when I look at that and say, “Wow, that’s really low resolution, I meant to change that out because that’s just too fuzzy when I project it.” How will I know where I got it so I an go back to the source and maybe get a better image or find some other accompanying image that I vaguely recall was there that I think, oh man I should have used that, should have grabbed that while I was there and now I don’t know where it was I went to get that. Or maybe I’m using images from the textbook and I’m not quite sure, is that from the current edition, maybe that’s been updated, maybe the labels have been added to that or maybe some other little part has been added in or taken away or has been improved in some other way. How do I know what edition it’s from if I hadn’t recorded what edition that was from. Kevin Patton: So there’s kind of a silver lining, it’s not only modeling best practice of professional integrity for our students to let them know is that’s what we do as professionals, we cite other people’s work, we acknowledge the work of other people. Not only that but it’s also helping me as an instructor keep track of everything. Where did it come from? Where did I get that? Now in an upcoming episode, a good friend of mine, Barbara Waxer who is a national speaker on this topic of what we can and can’t use in the classroom, where do we find images from the classroom, she’s going to help us with all of that in a future episode. But in the meantime, if you have questions or comments like Greg did, don’t be shy about calling the hotline at 1-833-546-6336, that’s 1-833-LION-DEN. Kevin Patton: My friend Ron Gerrits who is the past president of HAPS pointed out that in some of my episode pages and show notes, I had an error in the number. So if you’ve tried to call in before, use the correct number and call in and leave a comment. I went back and I think I’ve changed all the places where it’s an error. So if you catch an error, do what Ron did and drop me an email or give me a call and let me know that there was that error or any other error that you find and I’ll try and fix it. But we’re not done with this topic of academic integrity. We’re going to come back to that in a future episode, I guarantee it. Kevin Patton: I’ve mentioned before in an off handed way a blog that I do called The A&P Student and it’s sort of the student version of The A&P Professor, you would get there by going to theAPstudent.org and you’ll see several years worth of posts that give advice to student of human anatomy and physiology. Some of it is specific advice on particular topics within human A & P and some of it is general advice just on studying and learning. For example, how to reduce test anxiety, how to prepare for an exam, as well as specific things like how do I study the skeleton, how do I study tissues. You know some of them are the particular pain points that we observe in our own students in A & P. So you are welcome to not only like to the blog in general but to any post within that blog from your course or from your course materials. Kevin Patton: I have a set of bookmarks that I have for many years given out to any A & P teacher that asks for them, as long as you’re actually teaching A & P or related course. These bookmarks are a nice little playful gift to give out, they’re kind of a weird little, I call them eyeball bookmarks and if you go to theAPstudent.org and find the bookmark page which I’ll tell you how to get to in a minute. You’ll see what they look like and you’ll see how weird they are. As a matter of fact, I’ll put a picture of it in the show notes in episode page so you don’t even have to go that far to see them. Kevin Patton: I’ll send you a stack of those bookmarks, all you have to do is to go to theAPstudent.org and in the menu click Tool and Topics and you’ll see a link for Free Bookmarks. You click on that and you’ll see that there are some other gifts that I’ll send along with it, these bookmarks on the one side have that graphic of eyeballs and on the other side it has a link to The A&P Student blog. So that would be a fun thing to give out to your students that they can use that bookmark and hopefully they’ll follow that link and they’ll learn some things and get some help and get some coaching in how to study and how to learn human A & P. So free gift to you, check the show notes. Kevin Patton: Oh, one other thing, but wait, there’s one more thing. In the form that you fill out your name and address for where I send them to, there’s a little section that says, do you have something else you need to tell us. If you put in there that you’re a podcast listener I will also send you a collectors item. It is a lapel pin with The A&P Professor logo on it that you can wear on your lapel to class. You can wear it on your lab coat, you can put it on your backpack, you can surprise your friends and neighbors that you have one of these very rare items. So make sure you put that on the form when you’re requesting the bookmarks. I also want to mention that this is something I literally do in my basement, my wife helps me with this and we just send them out every once in a while. So get your request in early so that you’ll get it before the end of the semester. I’ll see you down the road. Audio: The A&P Professor is hosted by Kevin Patton, Professor, blogger and text book author in human anatomy and physiology. Kevin Patton: Please dispose of this episode responsibility.